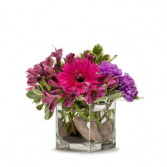 Picked fresh from the farm to offer your special recipient a bouquet blossoming with sunlit cheer, the Come Rain or Come Shine Mixed Flower Bouquet is set to send your warmest greetings to friends and family near and far. 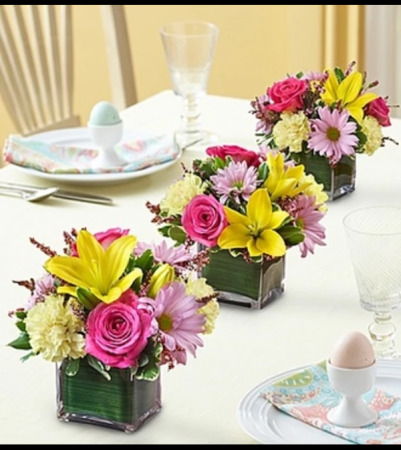 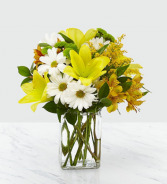 Hand gathered in select floral farms and bursting with the spirit lifting color combination of yellow and white, this simply beautiful flower arrangement has been picked fresh for you to help you celebrate a birthday, offer your congratulations, or express your thank you or get well wishes. 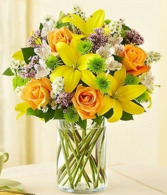 This bouquet includes the following: yellow Asiatic Lilies, yellow Alstroemeria , green Button Pom , white Daisy Pom , yellow Solidago,and an assortment of lush greens.